For the first time, the US Food and Drug Administration (FDA) has approved a digital pill; a medication that includes a sensor which informs the prescriber about the medication taken by the patient (if he/she has taken it, and when it was taken). It represents a transcendent advance in solving the problem of therapeutic adherence; the cause of failures in some important and expensive drugs. According to experts, therapeutic non-compliance (now referred to as “poor therapeutic adherence”) is very costly, and some experts estimate that this could cost more than 100 billion dollars a year (1) due to hospital admissions and additional treatments that may be required. Omissions are a very important aspect of non-compliance, especially in the case of elderly people who, in addition, often have complex pharmacological prescriptions. The first digital pill to be chosen was Abilify® (Aripiprazole ), approved as an antipsychotic in 2002. The patient must give his/her consent so that the information provided can be received by his/her prescribing doctor, and up to four other people - generally family or carers. All these people receive an electronic record of the medication that the patient has taken. Obviously, this information is subject to privacy legislation. This matter has generated some controversy. Peter Kramer, psychiatrist and author of the informative book, "Listening to Prozac", which helped to popularise a new kind of anti-depressant drug which later became a true blockbuster, has criticised this technological breakthrough, stating that this is like "packaging the medication with gossip incorporated". In other words, this practice could be coercive and contravene individual rights. Other pharmaceutical companies working on digitalised medication are aimed at developing computer tools which monitor whether the patient has placed the tablet on his/her tongue, and if he/she has swallowed it. Not all technologies will require the expressed authorisation of regulatory bodies. Some are already being utilised or tested on patients with heart disease, stroke, anti-retroviral treatments, and diabetes. Given that the digitalisation of therapeutic adherence requires an extra effort, such as wearing a patch or using an app on a smartphone, this technology may be more useful for elderly patients who are poly-medicated or others with requiring complex treatments such as those necessary for tuberculosis (3). The drugs for tuberculosis have to be taken for months or even years, and their effectiveness depends greatly on the correct compliance with the indicated prescription. Another application of this technology is the control of patients who have been prescribed opiates, and those who participate in clinical trials. Insurance companies could encourage the use of these digitalised medicines through co-payments, but, again, controversy arises about whether this procedure might be considered coercive. Another use could be that of ceasing the institutionalisation of psychiatric patients and granting them an ambulatory regime. In fact, the first digitised medication approved by the Food and Drug Administration was Abilify® (Aripiprazole), prescribed in three scenarios: schizophrenia (4), bipolar disorder (5), and, alongside others drugs, in the treatment of severe depression (6)). Therapeutic non-compliance is very common in psychiatric patients. This has serious consequences, not only for the patient, but the whole community. In these circumstances, digitalised anti-psychotic drugs can be of great help. Many schizophrenic patients stop taking their medication regularly because of its adverse effects or the suffering of paranoia; they believe the doctor is trying to poison them. The digital system has the ability to monitor the behaviour of patients and send warning signals to their doctors. 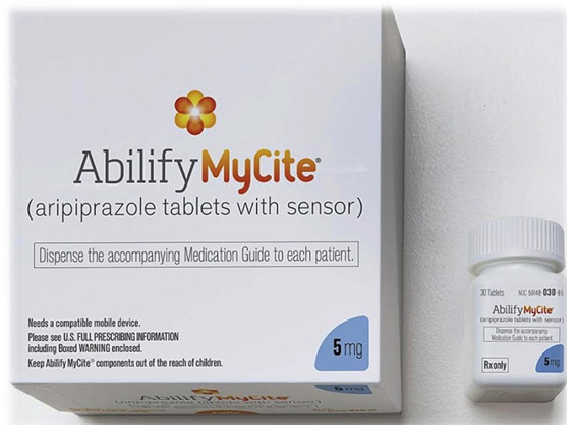 The digitalised version of Abilify®, approved by the Food and Drug Administration, is called Abilify MyCite®, and is the result of the collaboration between the anti-psychotic manufacturer, the Japanese pharmaceutical company Otsuka Pharmaceuticals, and Proteus Digital Health, based in California. The sensor, containing copper, magnesium and silicon (safe ingredients found in many foods), generates electrical signals when the tablet is lixiviated by the effect of gastric juices. After several minutes this signal is detected by a band aid-like patch located on the left side of the patient's chest. These patches should be replaced every 7 days. The patch sends information (date and time of the administration of the drug and degree of the patient’s activity), via Bluetooth, to a smartphone app. This app allows the patient to add complementary information about their mood and other health parametres, both to the doctor and to other people (a maximum of four) who are in charge of his/her care. Otsuka Pharmaceuticals has not determined the price of Abilify MyCite®. Its restricted marketing is planned for next year. The price will be based on the success of the device during this first stage of limited marketing. Some psychiatrists propose to begin the prescription of this digitalised medicine in patients who suffer a first psychotic episode, since they are more likely to stop taking the medication when they perceive an improvement in their symptoms. At the moment, the authorisation for the use of Abilify MyCite® is to monitor the correct taking of the medication, not to achieve a greater therapeutic adherence. However, the ultimate aim of this technological advance is to reduce the number of hospital re-admissions and improve the personal and social life of the patients. The patent for Abilify® expired recently. Thus, different laboratories can market generic versions of Aripiprazole. However, Otsuka Pharmaceuticals maintains exclusive rights to the sale of the digitised version (Abilify MyCite®). Proteus Digital Health developed this sensor, which has already generated $400 million after conceding its use to companies such as Novartis AG., and Medtronic. Until now, the sensor was not embedded within the tablets. Pharmacies could be commissioned to insert it into a capsule containing a re-packaged and dispensed medication. In 2016, the sensor started to be used in clinical trials. In pharmacies, it was added to drugs destined for two clinical scenarios: hepatitis and hypertension. Some studies have shown that it improves therapeutic adherence in patients with uncontrolled hypertension (7). AidCure registered a visual recognition system where smartphones can document the taking of the medication. This system has been applied successfully to patients under treatment for tuberculosis. Tests were carried out in Los Angeles, California, and now, in 2017, they are going to be instigated in Chicago, Illinois. A company based in Florida, EtectRx, makes another sensor that is ingested: the ID-Cap®. It was tested with opioids, anti-retroviral medications, and other drugs. ID-Cap® is made using magnesium and silver chloride. This sensor is inserted into tablets and does not require an external patch. ID-Cap® sends radio signals that are picked up by a nearby antenna. The company plans to apply for its approval by the Food and Drug Administration in 2018. The radio signal of the ID-Cap® device is detected by a reader that is worn around the neck. However, soon the reader will be integrated into watches or the casing of a mobile phone. In a society as individualistic as in North America, this type of technology poses many ethical problems. Otsuka Pharmaceuticals has commissioned several experts in bioethics to address these types of issues. 3. López-Tricas J.M. El esquivo bacilo de Koch. In: http://www.info-farmacia.com/historia/el-esquivo-bacilo-de-koch. 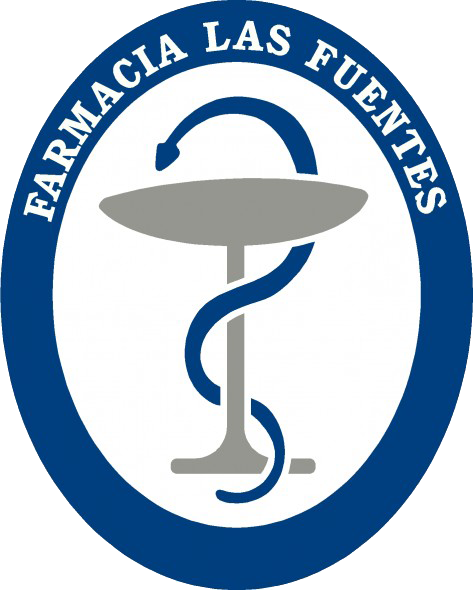 (www.info-farmacia.com).Consult: November, 2017 (Spanish).